Water needs are influenced by environmental temperature, class of livestock, and weight. Photo courtesy of Troy Walz. 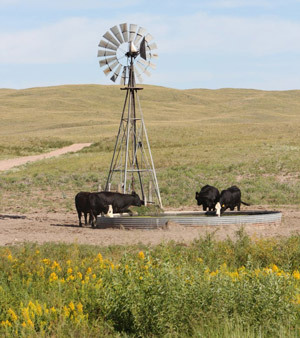 Many times the importance of water to beef cattle is overlooked. Diets are balanced for carbohydrate (energy), protein, vitamins, and minerals so cattle can achieve a desired level of performance; but cattle also have a requirement for water. Animal performance can be affected by water intake. In fact, of these nutrients, water is most critical. The minimum requirement of cattle for water reflects the amount needed for body growth and fetal growth or lactation and the amount needed to replace what is lost by excretion in urine, feces, or sweat or lost by evaporation from the lungs or skin. Anything influencing these needs or losses will influence the water needs of livestock. Under conditions of restricted water intake, an animal may concentrate its urine by reabsorbing a greater amount of water than usual. While this capacity for urine concentration is limited, it can reduce the water requirement. When an animal consumes a diet high in protein or salt or a diet containing substances having a diuretic effect, the excretion of urine increases and there is an increased water requirement. The amount of water lost through evaporation from the skin or lungs is important and, in some cases, may even exceed what is lost in the urine. If the environmental temperature and/or physical activity increases, water losses through evaporation and sweating increases. A number of factors interplay and make water requirements and needs difficult to assess. Because feeds themselves contain some water and the oxidation of certain nutrients in feeds produces water, not all the water needs must be provided as drinking water. Feeds such as silages, green chop, or pasture are usually high in moisture, while grains and hays are low. When cattle consume feeds high in water content, water intake is reduced. High-energy feeds produce more metabolic water compared to low-energy feeds. Fasting animals or those on a low-protein diet may generate water from the destruction of body protein or fat, but this is of minor significance. Water needs are influenced by environmental temperature, class of livestock, and weight. Water needs increase as temperature increases. Lactating cows have greater needs than nonlactating cows. Bulls have a greater daily water requirement than nonlactating cows. This is a function of weight. As cattle get heavier, daily water intake increases. A University of Georgia publication lists the estimated water requirements for cattle in different production stages when the daily high temperature is 90 degrees F. The data suggest for cattle in this environmental condition, a growing animal or a lactating cow needs two gallons of water per 100 pounds of body weight. A nonlactating cow or bull needs one gallon of water per 100 pounds of body weight. As an example, spring-calving cows will need close to 20 to 24 gallons of water per day for themselves and another 5 to 10 gallons for their calf in these high temperature environmental conditions. Remember, some of the water will come from the feed they eat and/or vegetative grass which is high in water content. Also, for the nursing calf, a portion of the daily water needs will come from the dam’s milk. Nitrates, sulfates, and blue-green algae can affect water quality. A safe level of nitrate nitrogen (NO3N) in the water for cattle is less than 100 ppm. The sulfate upper limit for calves is less than 500 ppm (167 ppm sulfur as sulfate). For adult cattle, the upper limit is less than 1,000 ppm (333 ppm sulfur as sulfate). Stagnant water, lakes, and ponds are ideal environments for the growth of blue-green algae, which can be toxic to cattle. When in abundance, blue-green algae gives the water the appearance that someone has dumped a bucket of light green or turquoise paint in the water. Signs of blue-green algae poisoning are diarrhea, vomiting, lack of coordination, labored breathing, seizures, convulsions, and possibly death. Other problems that we may find with water are high or low pH, or excessive levels of sulfates, hydrogen sulfide, iron, and magnesium. Many times these substances in water cause an “off flavor” and impact water intake. Providing clean, fresh water is always a goal for the livestock producer. There are a number of items that affect water quality. Producers need to adopt management practices that do not negatively impact water quality. For more information, please see the Nebguide “Water Requirements for Beef Cattle” (PDF version, 628KB).